LeRoy and Lewis Barbecue's winning entry at the 2017 HOU-ATX Throwdown, a Peaceful Pork bone-in pork belly, with brisket fried rice, kimchi, and fish sauce caramel. Photo by Shawn Chippendale, courtesy of Houston Barbecue Festival. Which city in the Lone Star state boasts the best barbecue? Is it Austin, long known for the standard-setting smoky meats of Central Texas? Perhaps it is actually Houston, home to a batch of lauded newcomers who have breathed new life into Texas barbecue with bold, international influences. Last year’s HOU-ATX BBQ Throwdown gave pitmasters the opportunity to battle it out (in a friendly way, of course) and, unfortunately for Houston, Austin took home the crown. However, the Bayou City is getting another chance to prove its barbecue dominance. This year’s competition is in Austin (since it won home turf rights in 2017) on Sunday, December 9, from 1 to 4 p.m. at Friends and Allies Brewing Company at 979 Springdale. The Houston pitmasters are ready and anxious to try to reclaim the crown and the corresponding bragging rights at the Austin competition. The restaurants that are competing qualified by being top finishers in the fourth annual Houston BBQ Throwdown in September. Participating are Beaver’s (2017 Judges’ co-champion), Daddy Duncan’s BBQ (2018 People’s Choice and Judges’ champion), El Burro & the Bull (2017 Judges’ co-champion), Harlem Road Texas BBQ, and Victorian’s Barbecue. 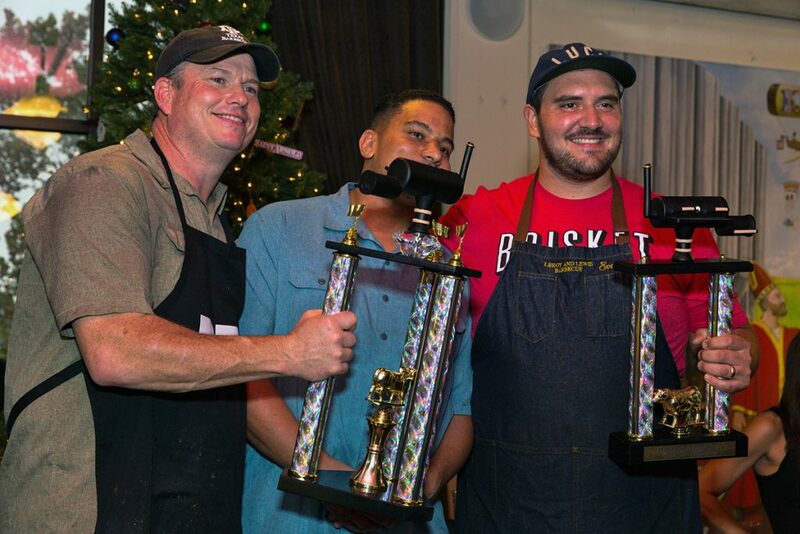 John Brotherton and Marvin Briley of Brotherton’s Black Iron BBQ, and Evan LeRoy of LeRoy and Lewis Barbecue, Judges’ co-champions at the 2017 HOU-ATX BBQ Throwdown. Photo by Shawn Chippendale, courtesy of the Houston Barbecue Festival. Participating Austin-area barbecue joints include Brotherton’s Black Iron Barbecue (Judges’ co-champion from 2017), Banger’s Sausage House, LeRoy and Lewis Barbecue (People’s Choice champion and Judges’ co-champion from 2017), Micklethwait Craft Meats, and Stiles Switch BBQ & Brew. “We’re just excited to bring the Throwdown to Austin. It will be fun to have all the HOU crew in town,” said Evan LeRoy of LeRoy and Lewis. Bodacious Bar-B-Q from Longview and Brett’s Backyard Bar-B-Que of Rockdale are participating in the 2018 event as wildcard entries. The final lineup is subject to change. 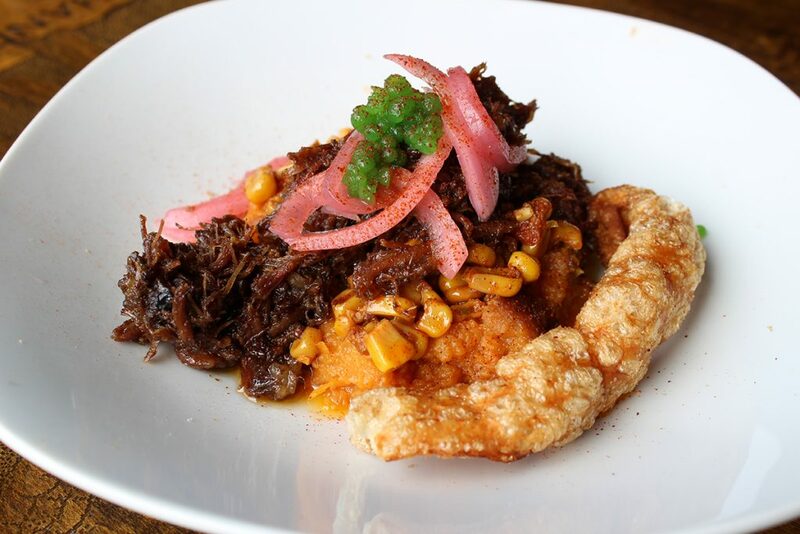 Winning entry from Daddy Duncan’s BBQ at the 2018 HouBBQ Throwdown, “The Altuve,” smoked beef cheek barbacoa with sweet potato mash, chorizo and bacon street corn, pickled onions, habanero caviar, and fried pork cracklins. Photo by Scott Sandlin. All participants are expected to present their visions of the perfect Texas barbecue dish. 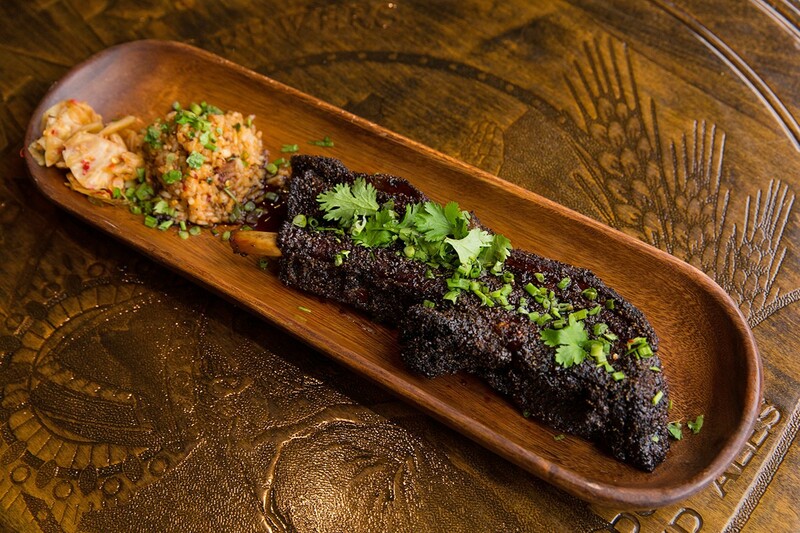 These are typically creative concoctions that push the boundaries of traditional Texas barbecue offerings, such as brisket, ribs and sausage simply smoked and presented as-is. The primary criteria is that the dish must have a smoked element to it and judges also consider appearance, flavor and texture. . The judges are barbecue, food, and beverage experts from around Texas and they are scoring the entries using a blind process so they don’t know which restaurant is entering which dish. The members of the judging panel are Matthew Odam of the Austin American-Statesman, Daniel Vaughn, barbecue editor of Texas Monthly magazine, barbecue photographer Robert J. Lerma, Austin-based food writer Paula Forbes, and Friends and Allies Head Brewer Nathan Crane. The barbecue joint with the highest cumulative score wins. In addition, there is also a “People’s Choice” award voted on by attendees. 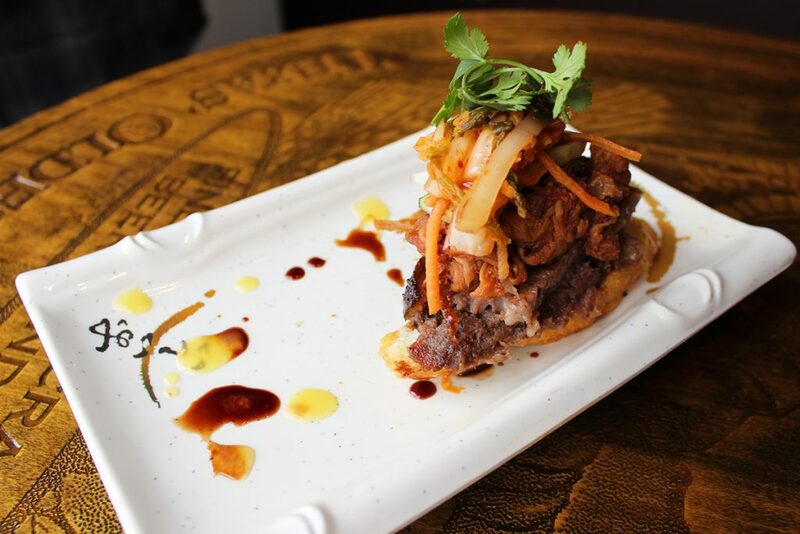 Brotherton’s Black Iron Barbecue’s winning entry at the 2017 HOU-ATX BBQ Throwdown, the “Pigpen & Pasture Banh Mi Crostini,” smoked beef cheek pate, Korean BBQ brisket & pulled pork, housemade kimchi, pickled daikon and carrot, English cucumber, Thai chili pomegranate gastrique and mango jalapeno coulis. Photo by Scott Sandlin. General admission tickets are $80 and on sale for a limited time, and you can use the promotional code BESTBBQ2018 for a $10 discount. Entry includes unlimited barbecue samples from all participating vendors and two 12-ounce servings of Friends and Allies craft beer. All tickets are sold in advance online and are limited to ensure a quality event for both guests and pitmasters. There are no ticket sales at the event. The popularity of past Throwdown events means it will likely sell out quickly, so those who want to go should purchase tickets as soon as possible. Guests traveling from Houston might consider making a weekend of it in Austin. Event organizers have partnered with the nearby Hilton Garden Inn Austin Airport to provide rooms at a special rate for the Saturday night before the Throwdown. 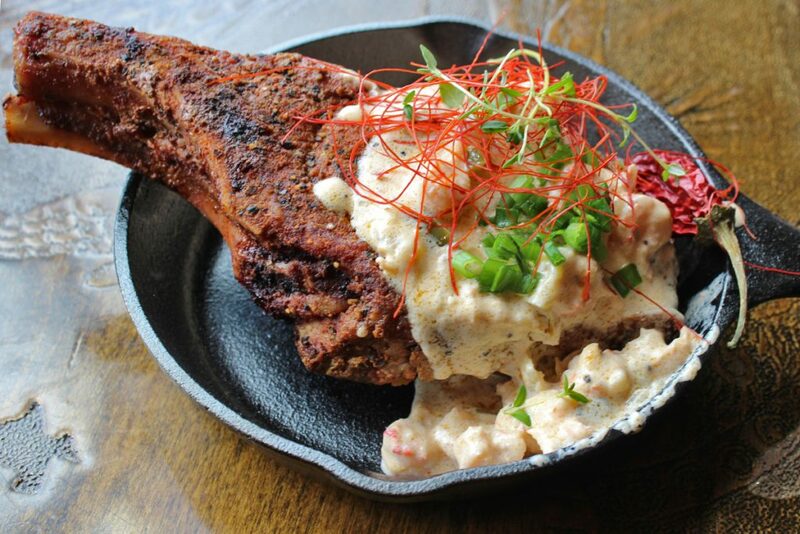 Entry from Victorian’s Barbecue at the 2018 HouBBQ Throwdown, a double-cut smoked Creole pork chop, stuffed with boudin, and topped with crawfish cream sauce. Photo by Scott Sandlin. 2018 HOU-ATX BBQ Throwdown, Sunday, 9 December 2018, 1 to 4 p.m. at Friends and Allies Brewing at 979 Springdale Rd #124, Austin, TX 78702. More information and tickets are available online, as is discount rate information for the Saturday night stay at the Hilton Garden Inn Austin Airport.